MLB Draft Prospect: Dansby Swanson – SS – Vanderbilt. Bats: R Throws: R – 6’1″ 190. Born: 2.11.1994. Previously Drafted: 2012 – Colorado (38th Round). A 4.0 student at Marietta (Ga.) High School and teammate of 2010 first round pick Chevy Clarke (Anaheim), Swanson was considered a tough sign and slid to the 38th round of the 2012 draft, where he was selected by the Colorado Rockies. As a freshman in 2013, foot and shoulder injuries limited Swanson to just 11 games and 16 ABs. Swanson won the starting second base job for the Commodores in 2014 and would go on to be named the Most Outstanding Player in the College World Series, while leading Vanderbilt to the first national championship in school history. It’s important to note that I’m not a scout. I don’t have the knowledge or training that they have. I do go get live looks at these players and I talk to scouts. While scouts typically reserve their reports for their employer, I can share my thoughts on the player with you, the reader. How lucky are you? HITTING – Swanson should hit for a high average thanks to a compact swing and an above average eye at the plate. Swanson has shown good patience at the plate, walking in 13.2% of his career plate appearances. Swanson owns a career K% of 15.4%, and while that would be above average as a professional, it’s higher than one would expect from the projected #1 overall pick. POWER – Though he has hit 14 HR this season including 5 so far in this post-season, Swanson has just average power and projects to be more of a doubles hitter as a professional. SPEED – An owner of above average speed, Swanson gets out of the box well from the right side and gets enough good jumps on the base paths to steal 38 bases in 45 attempts for his career. 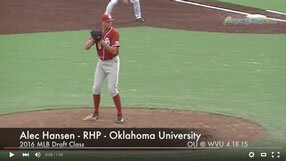 ARM – Swanson’s arm was a question mark coming out of high school and entering this season after his transition from second base. This season he’s made enough plays in the hole to his right to silence his critics and prove that the arm is at least solid average. DEFENSE – First step quickness, soft hands, and a strong accurate arm make Swanson an above average shortstop and a good bet to stick at the position as a professional. FUTURE – Swanson is projected to go #1 overall next week and won’t make it out of the top 3 picks. Swanson’s greatest strength is his lack of weaknesses. In a draft class lacking cathedral ceiling players, Swanson’s safe tools and exceptional leadership qualities make him an appealing prospect.